A common phrase in English is “the breakfast of champions” which is often used to describe a specific foodstuff or collection of drink and food that will transform someone into a winner. 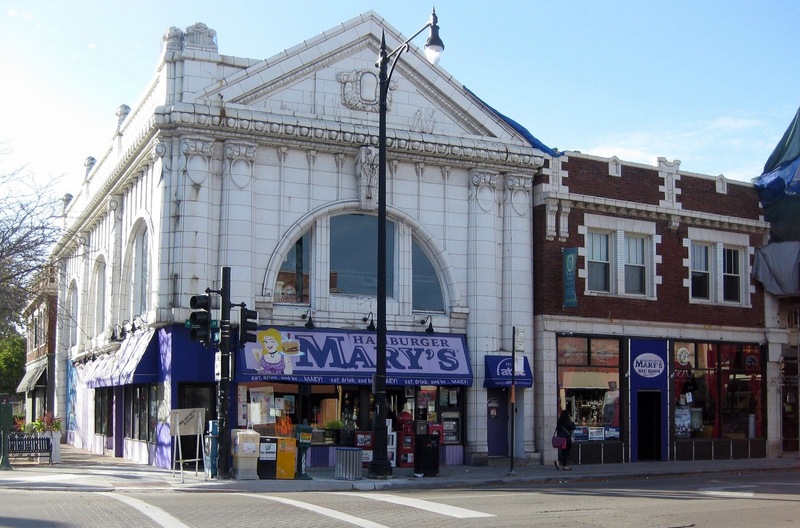 However, a tougher title to achieve is “champion of breakfasts”, especially in a big and competitive market like Chicago. Now, I’ve had my fair share of flapjacks, scramblers, and skillets, and it’s really just the tip of the bacon-wrapped iceburg. 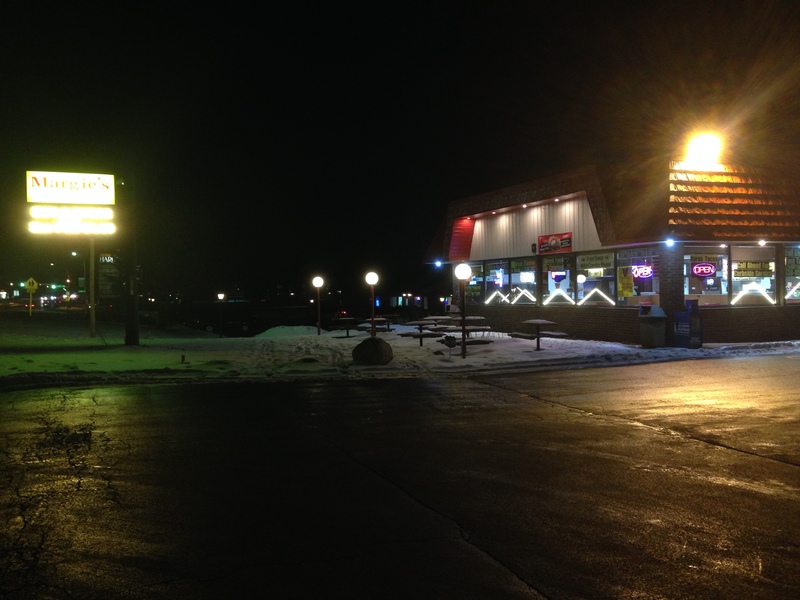 Not all diners are created equal though. 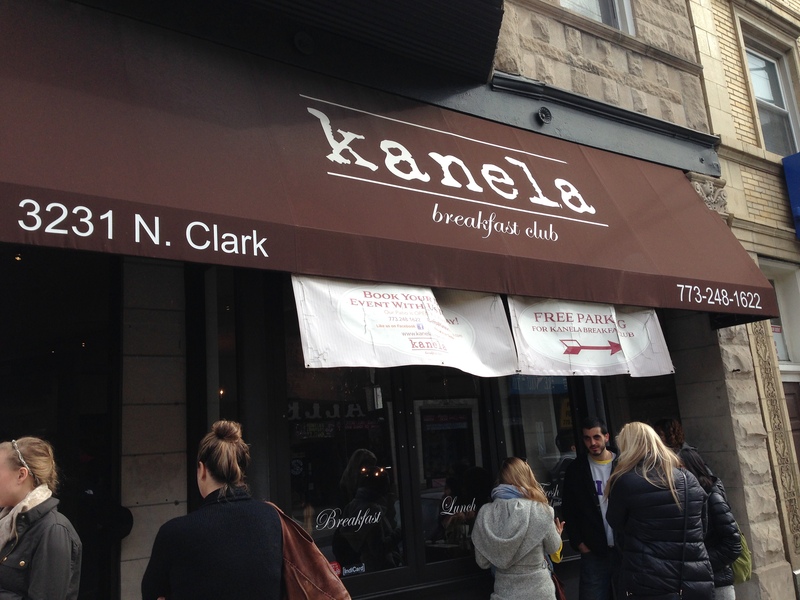 Kanela is one of those special franchises that has slowly, but surely, taken over the Chicago breakfast scene. “κανέλα” or Kanela means “cinnamon” in Greek, and this Greek American establishment of the same name is a temple to this once rare ingredient. I love my spices and seasoning, but I think that cinnamon is my favorite. Whether it’s in rolls, doughnuts, or French toast, I can’t get enough of the powdery and savory spice. So, when I heard that we would be paying a visit to it for a morning meal, I was over the moon. 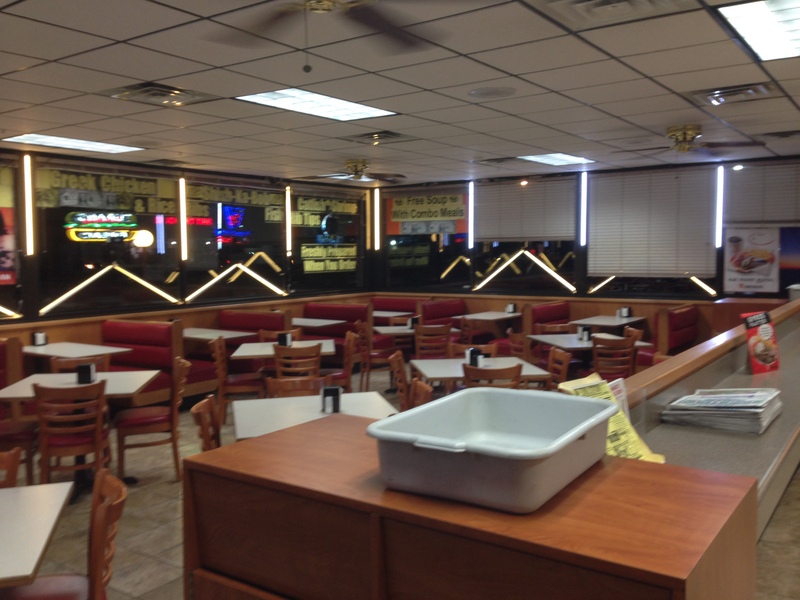 It had a modest exterior that belied its popularity as people were milling outside waiting for a table. 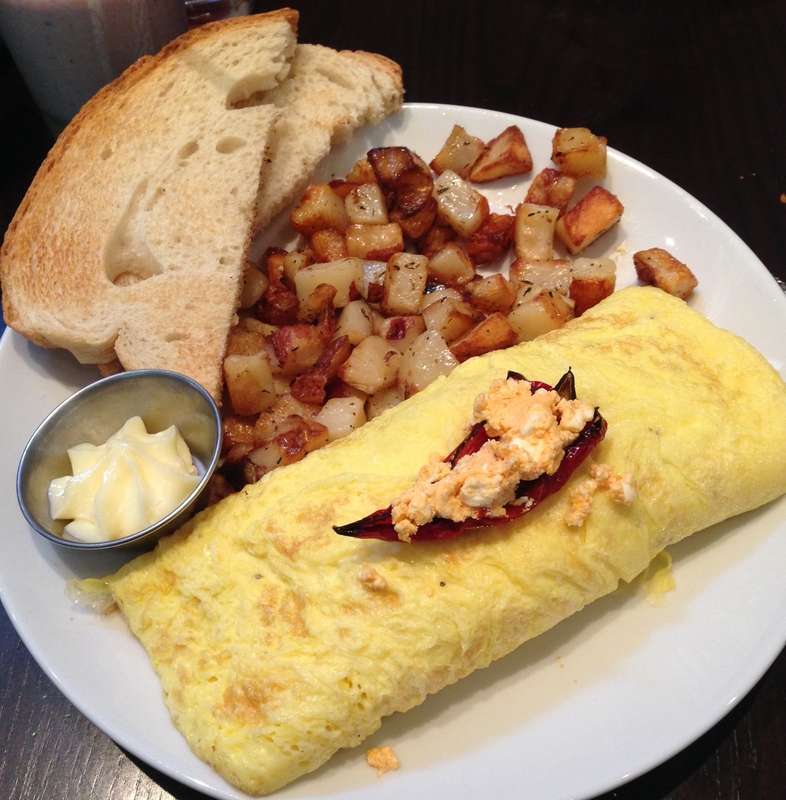 Thankfully, there is free parking nearby and on the street if you’re looking to take a large group to enjoy all of the great breakfast options we soon thereafter started sampling. 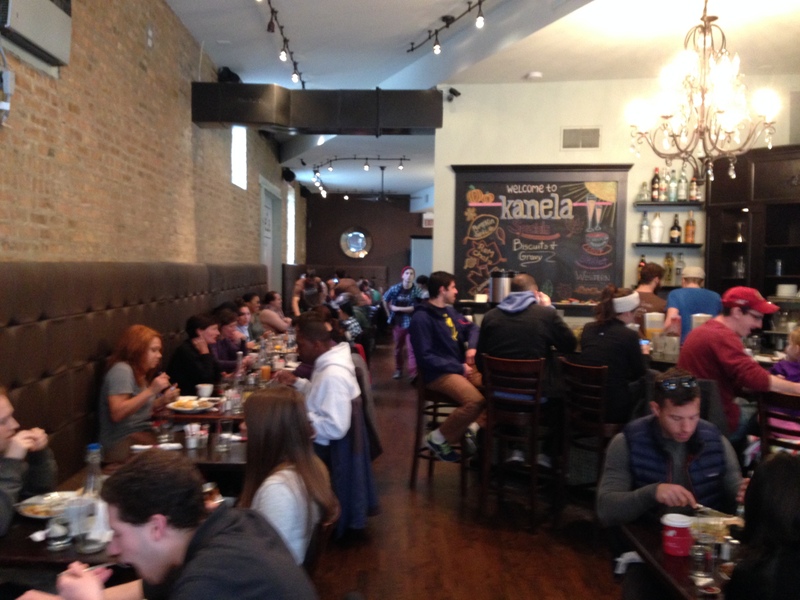 The place was absolutely poppin’ on a Sunday morning, go figure, but we got a table for two in no time. We started the meal off with drinks. 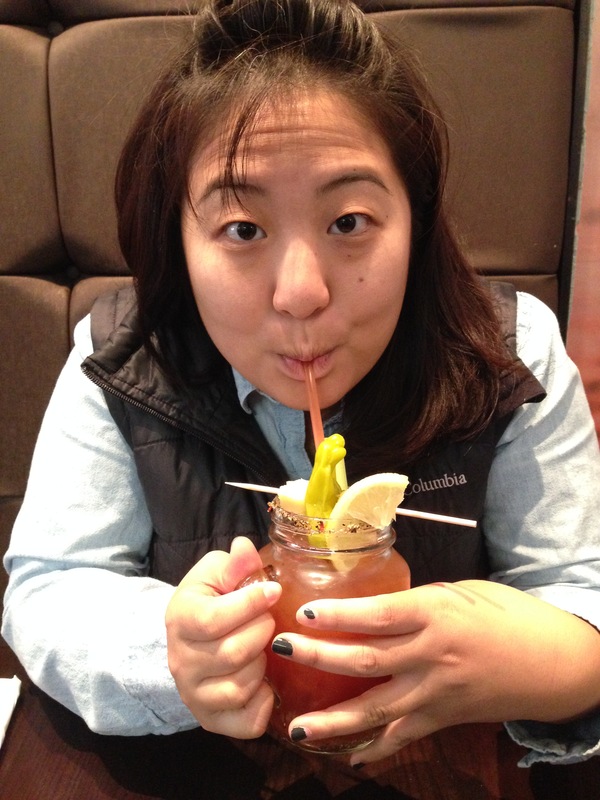 Janice got a Bloody Mary that was extra spicy and made with Absolut Peppar vodka to give it that peppy kick to wake you up and/or chase the mad dog of a hangover from last night away. 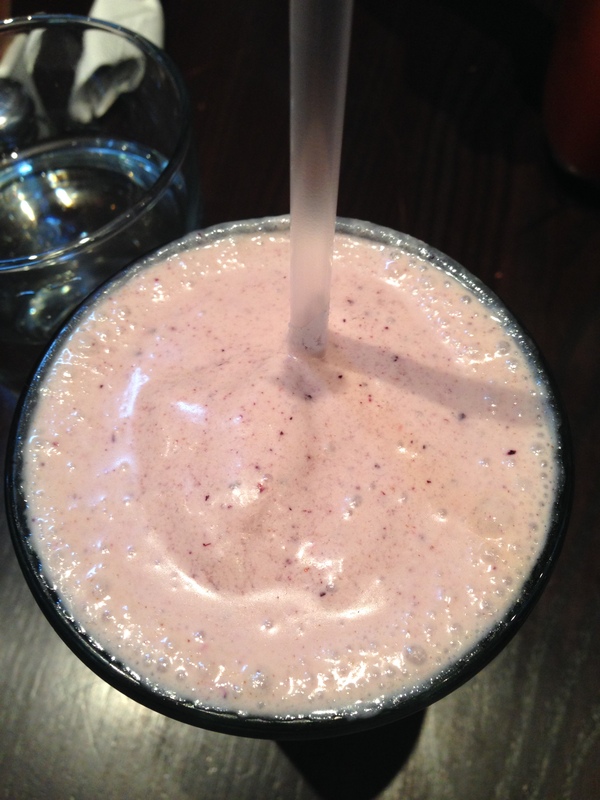 As for me, I went the healthier route with the PB & J smoothie ($6) which consisted of peanut butter, blueberry, strawberry, and organic agave nectar which is a slightly healthier alternative to regular sugar but much better than artificial sweeteners. Fun fact: the agave is the same plant that tequila is derived from as well, but don’t expect any sort of alcoholic punch with this natural sugar substitute. 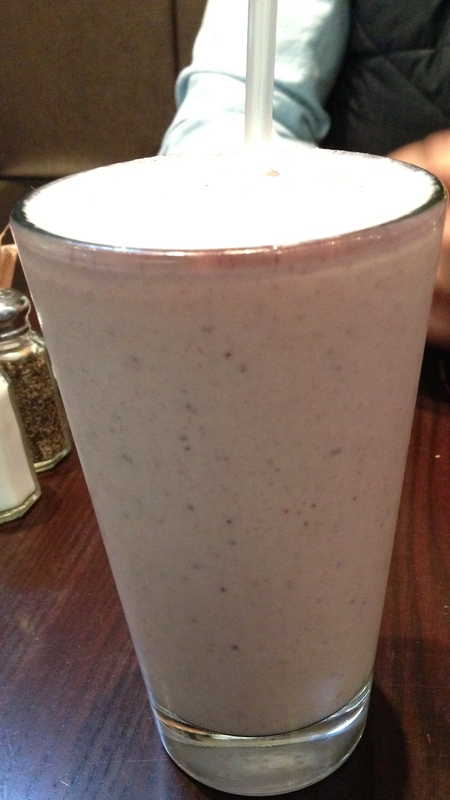 Surprisingly, this large glass of cooling ambrosia isn’t as sweet as you would imagine. It managed to capture the soul of the elementary lunch school staple with a splash of peanut butter mixing with the sweet fruits and syrup but in a much more understated manner. 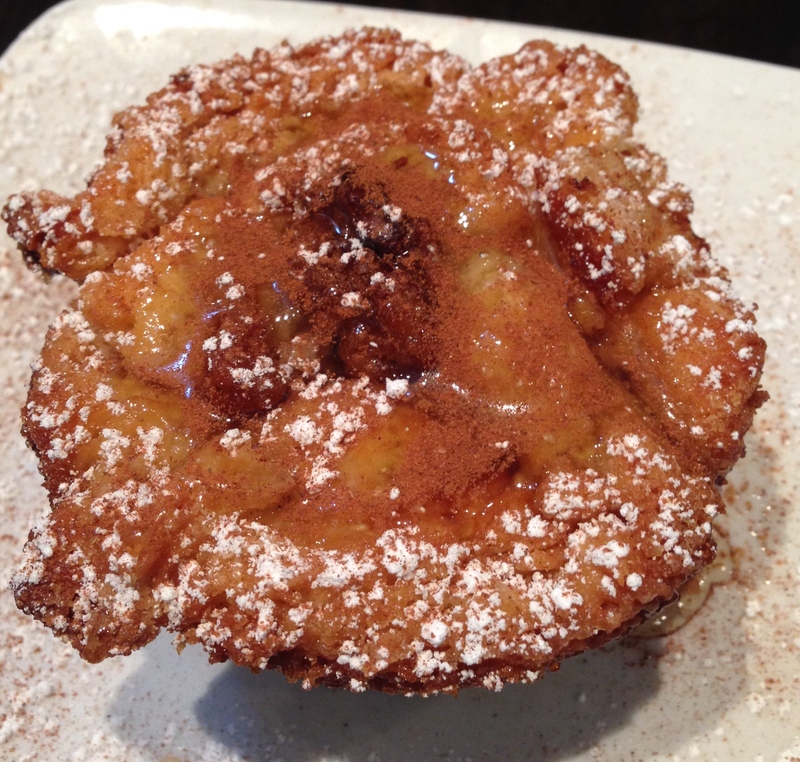 Once we had our beverages in hand, we started the food fest by sharing an order of monkey bread ($4). It came out and looked simply sinfully delicious. 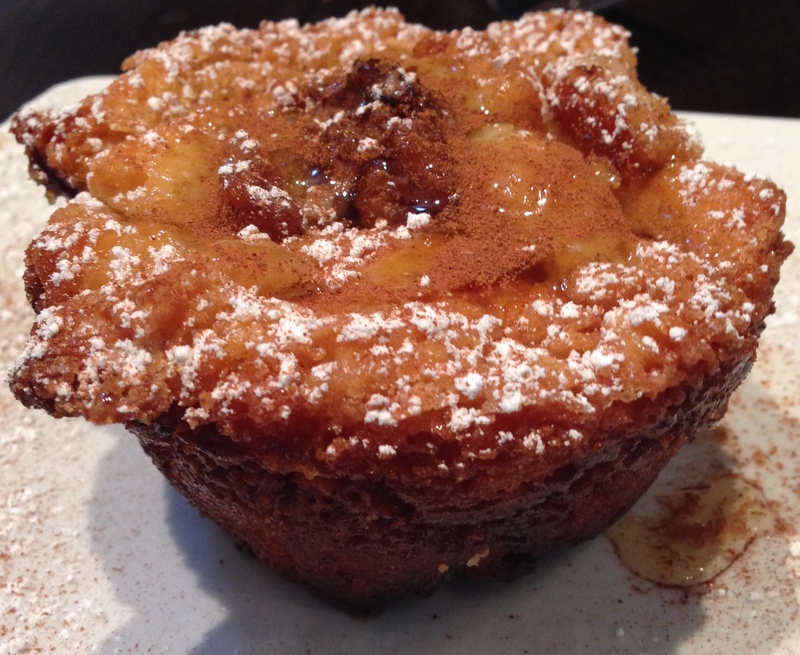 I often wondered why people call it “monkey bread” since it doesn’t look like something a monkey would eat or shaped like some sort of simian. After a bit of research, the origin of the sweet treat’s name is shrouded in mystery, but one theory postulates that its cracked and bumpy surface bears a certain resemblance to the bark of the monkey puzzle tree that grows in South America. With one bite of this appetizer, we went ape. Each piece we pulled apart from the bread was more flavorful than the one that preceded it. The cinnamon dusted on top combined with the honey drizzled on top made it taste like a mixture between a dulce de leche roll I had in Costa Rica and a classic cinnamon roll. Plus, it was slightly warm that pushed this dessert to the next level. 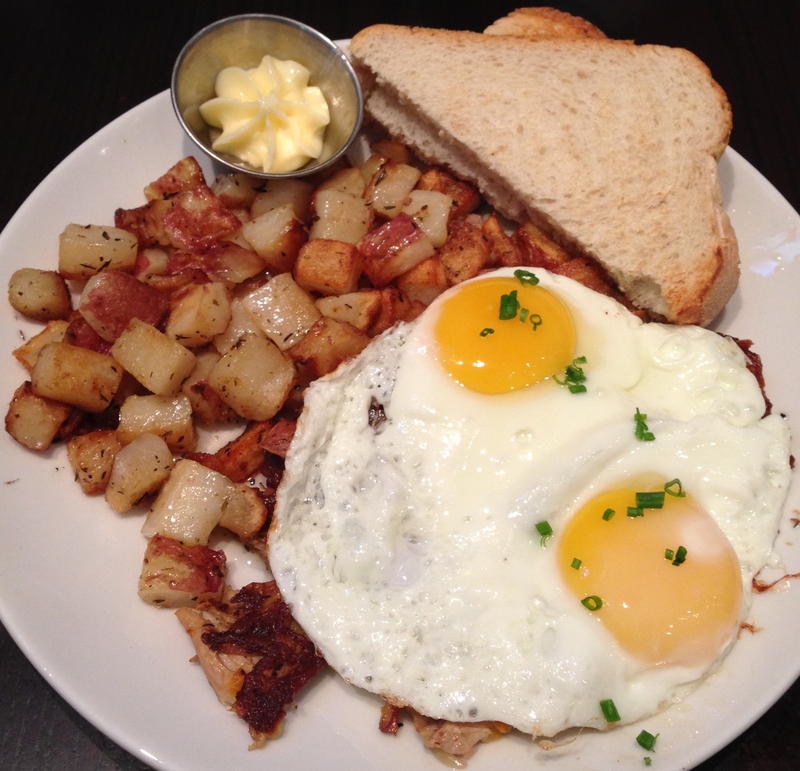 For our entrees, Janice got the duck confit hash ($12) while I ordered the spicy feta omelet ($11). 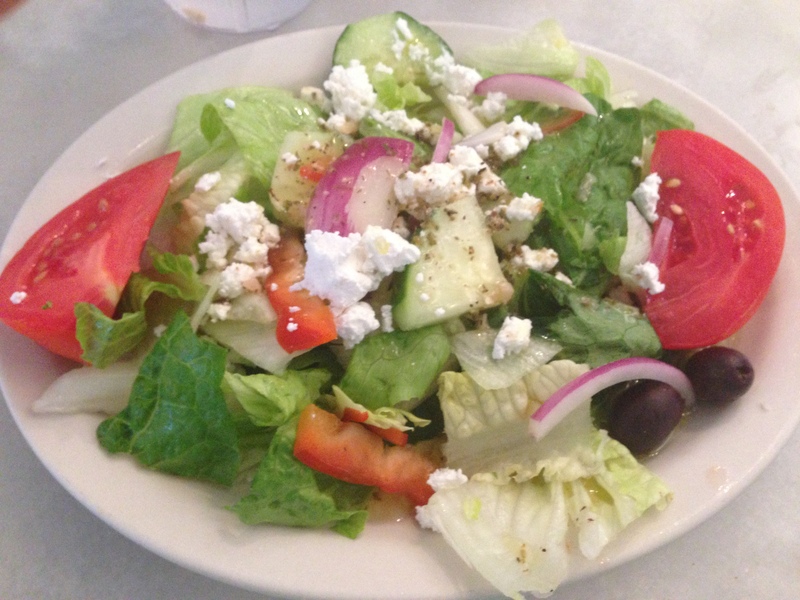 First, I have to mention that if you are any type of Greek restaurant or even just a restaurant owned by a Greek, you will get giant portions for your money. Kanela holds to this axiom. The duck confit hash looked mouth-wateringly good especially with the orange truffle vinaigrette that really piqued my interest and taste buds. Thankfully the duck wasn’t too greasy either which can often be a pitfall when ordering the fowl for a meal. 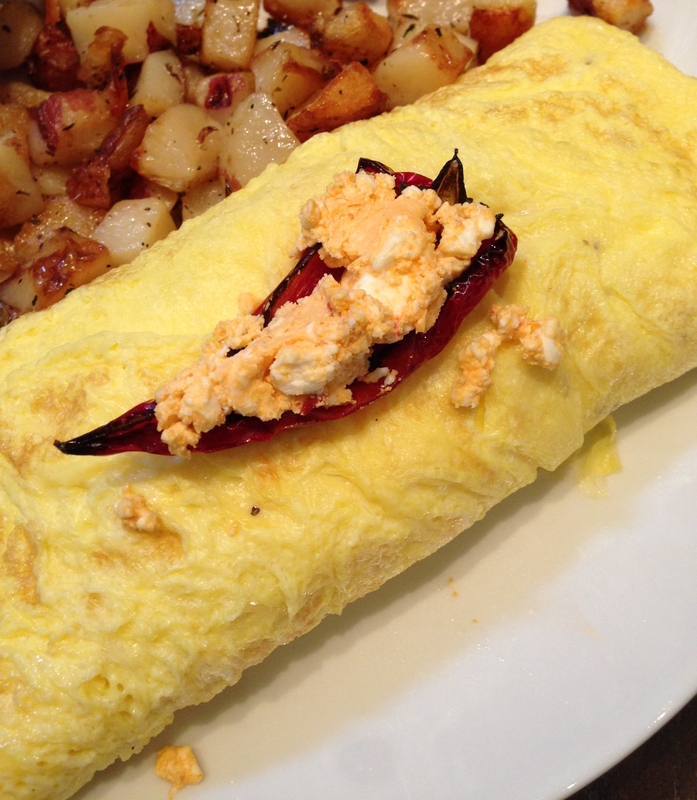 As for my spicy feta omelet, I really loved the fresno pepper garnish that served as a flashpoint of the meal. 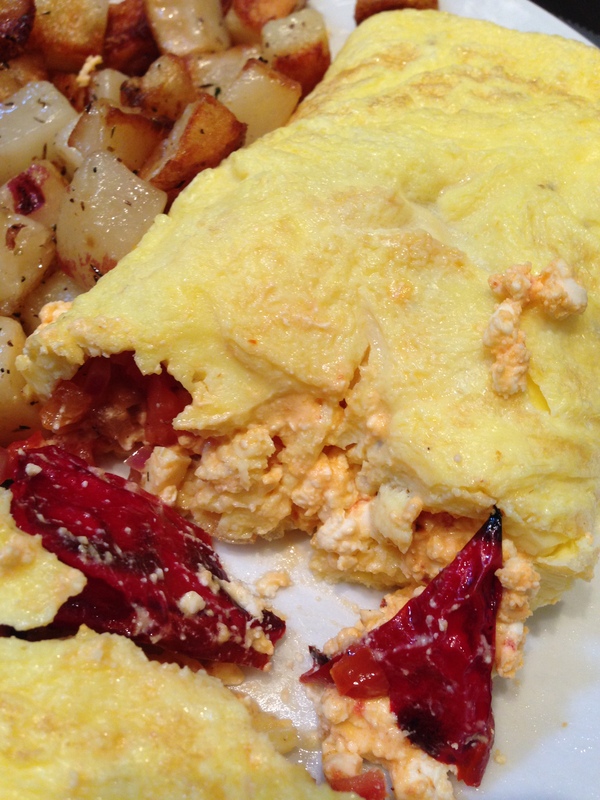 Its bright red skin immediately drew my attention at the newborn baby-sized omelet that was lying in front of me. The ends weren’t that packed with any sort of filling, just fluffy eggs. However, I soon got to the business end of things as I was greeted with a thick pocket of tyrokafteri cheese, red onion, and tomatoes. My advice for anyone wanting to get this is that it’s not terribly spicy, and make sure that you love feta cheese because there’s half of Greece’s supply in just this one omelet. So if you aren’t as big of a cheesehead as me, then consider yourself warned. It’s not for the faint hearted. The onions made a minimal impression on my palate, and the tomatoes were negligible. The potatoes on the side were not too greasy or too dry, and they worked well when mixed with the omelets or just on their own. By the end of meal, we were stuffed and satisfied with our trip to Kanela. 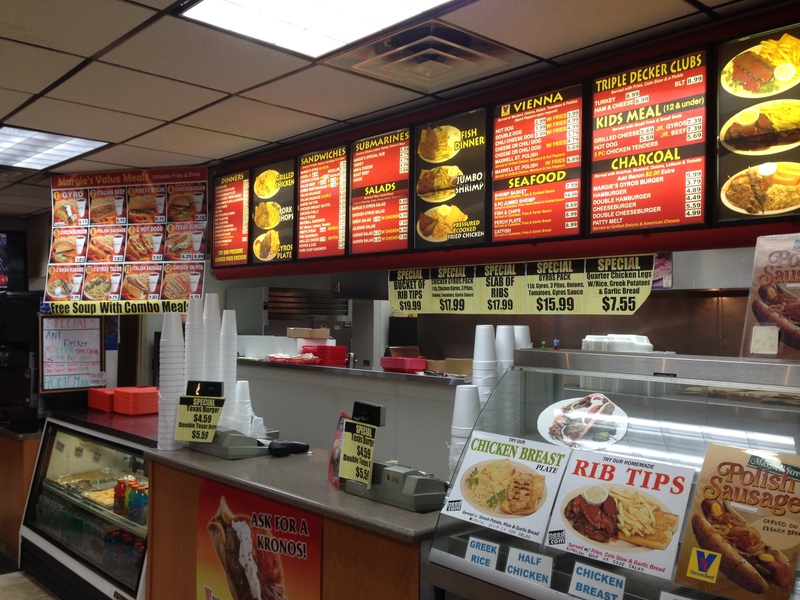 For the price, portion sizes, and overall quality of ingredients, Kanela can’t be touched. Posted in Breakfast and tagged Bloody Mary, breakfast, cheese, Chicago, Feta, fried, Greek, northside, omelet, peppers, potatoes, sweet. Bookmark the permalink. Tikanis, people? 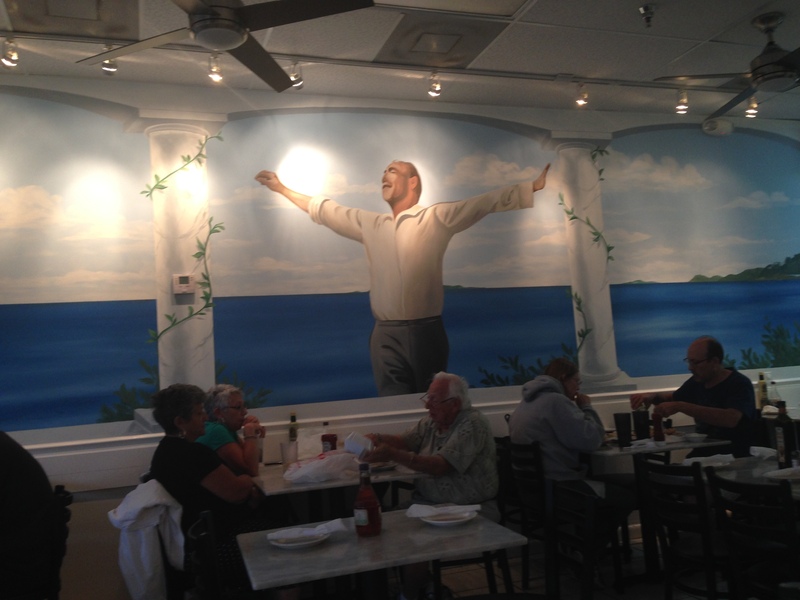 That’s “what’s up?” in Greek which is the language spoken at today’s reviewed eatery in, you guessed it if you’ve been reading my latest entries, Delray Beach, Florida. If you haven’t been reading through, some highlights include me taking down a giant chicken sandwich, eating a breakfast jammed in a burger, and a sexually titled sushi platter. So, after having Italian the previous day, I wanted to continue the Mediterranean theme with a proper Greek dinner or maybe I just had a hankering for some good Feta cheese. 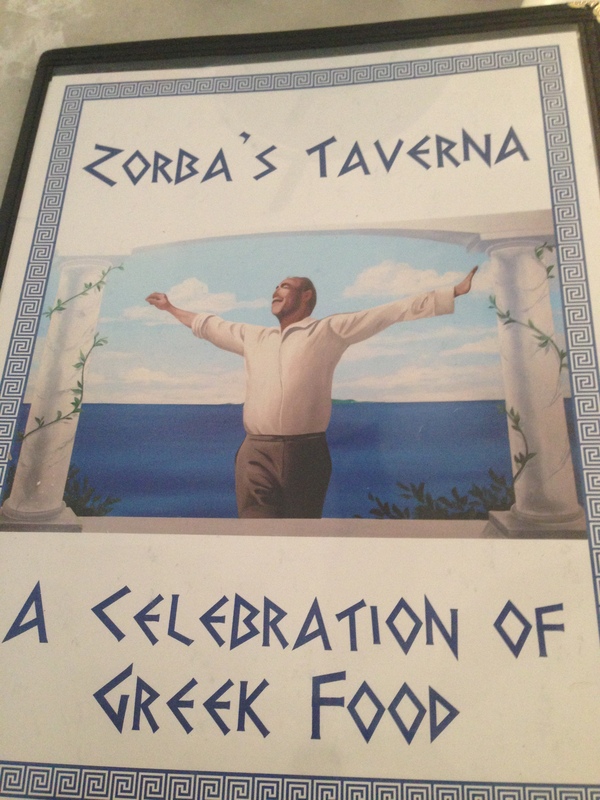 After a bit of sleuthing through the online food directories, I found Zorba’s Taverna that had a lot of great reviews where people raved about the tasty eats at reasonable prices. Perfect. It didn’t look like much from the outside as it was located in a strip mall, and coming from Chicago, I’m normally used to them looking like the white-washed buildings in Santorini. The sign on the door, on the other hand, already provided me with a taste of the Greek hospitality to come (thankfully sans broken plates). The place was moderately busy, but the seats quickly were occupied as we managed to beat the crowd rushing the doors trying to get out of the rain. Our waiter slowly sauntered over, and he seemed slightly off for some reason I couldn’t put my finger on. Nevertheless, he was amiable. Inside, Zorba’s Taverna was the Greek diner I was expecting complete with a classic Hellenic blue and white motif everywhere along with a fitting tribute to the Anthony Quinn film that serves as inspiration for the restaurant’s name. After looking over the menu that had all of the classic Greek dishes that they’ve served since antiquity like spanokopita, souvlaki, and baklava along with a couple newer Greek innovations like saganaki that was reinvented right in Greektown in my hometown of Chicago. My mom got an order of the saganaki ($8.95) for us to share to start off. For those who have never had the pleasure of trying saganaki, the name describes how the cheese, in this case vlahotyri, is melted in a frying pan since saganaki is the diminutive of sagani or a “frying pan with two handles”. The cheese is then eaten with a spritz of lemon and maybe a sprinkling of pepper. Once Greek immigrants came to America, they served this gooey cheese dish to diners, but as I mentioned before, the Greeks in Chicago added a bit more showmanship to this humble dish. What can add panache to any sort of performance art like preparing and serving food? Fire! 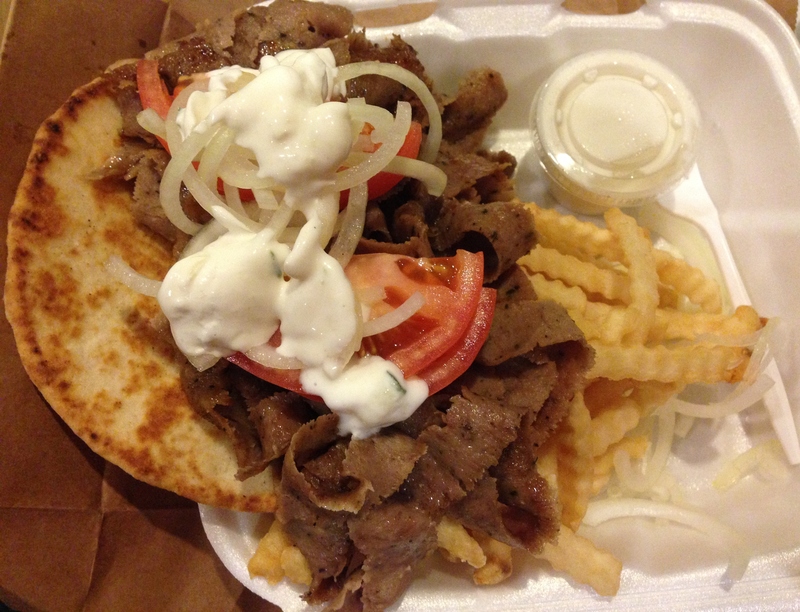 If you visit most Greek restaurants in the Chicagoland area, you can experience something like this. Strangely, in Florida they didn’t set the cheese ablaze but rather placed it on our table with a whimper along with a free plate of pita triangles and hummus. The saganaki sans flames was still delicious with a salty and citrusy flair to each forkful. As for the hummus and pita, I don’t know if they do this for every patron or if we were the 100th customers, but it was a great perk to our visit. 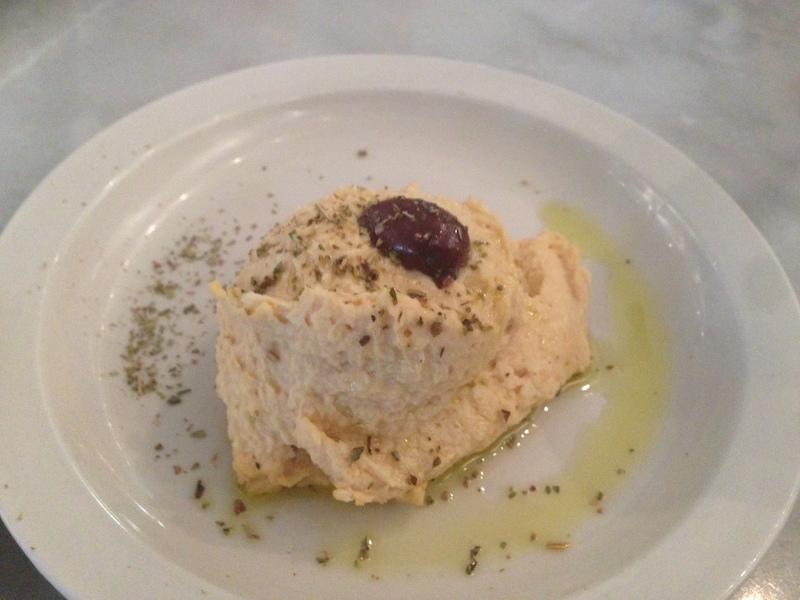 The pita was warm and fresh, and the hummus was creamy and evenly spiced with a liberal splash of olive oil. We then ordered our food where my dad got the tzatziki platter ($4.95), my mom got chicken souvlaki platter ($12.95), and I got a side of dolmathakia ($7.95) and the roasted Greek chicken ($14.95). Eventually, our food came out, and it all looked great. My dad’s tzatziki or cucumber sauce was thicker than I was used to compared to back home in Chicago but didn’t affect the overall quality. My mom informed me the chicken souvlaki or shish kabob was very dry. 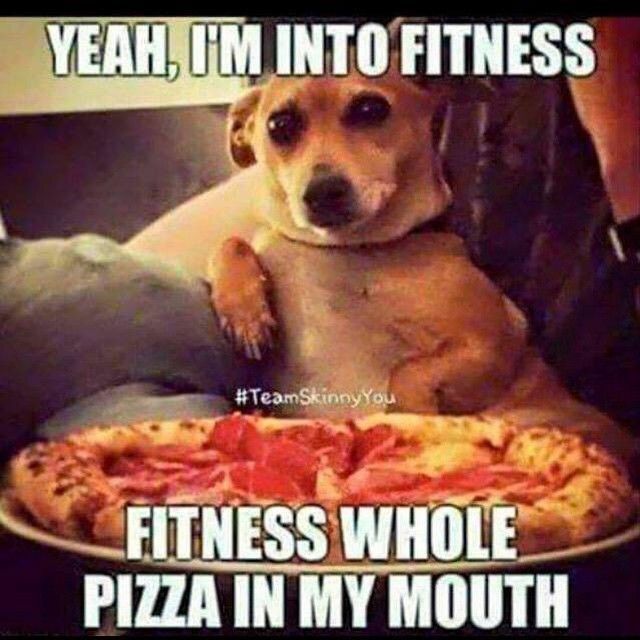 On my plates, on the other hand, I found nothing but mouth-watering choices. 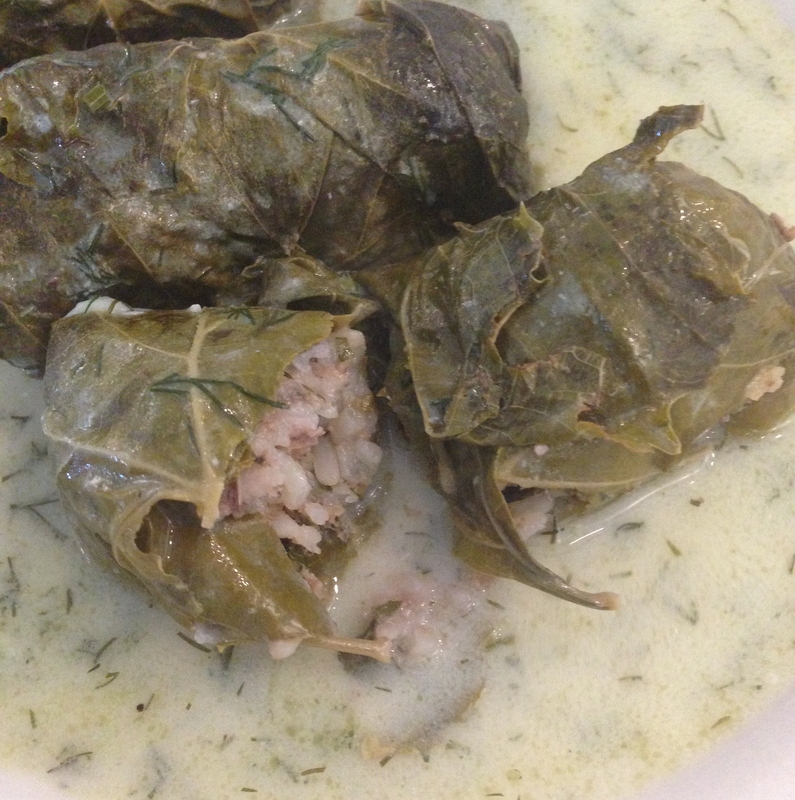 The dolmathakia consisted of cooked grape leaves that encased fluffy grains of rice with spices and just the right amount of dill that was further enhanced by the translucent dill broth that these mini-grape loves were stewing in. I got a free Greek salad on the side which was verdant and scrumptious along with the creamy pieces of Feta that scratched my itch for cheese like the big rat I am. As for my chicken, although it couldn’t hold an oil lamp to some of my Greek friends’ mommas’ cooking, it was alright for Delray Beach. The chicken was so well prepared that it literally fell apart as soon as I touched it with my fork. From the oregano coated skin to the juicy white meat interior, I was in a state of apotheosis as a foodie during this meal. Unfortunately, then it went downhill from the average green beans to the less than noteworthy potatoes on the side that were quite bland and hard. The tumble from the top of the Mount Olympus of food ended with a definite thud. 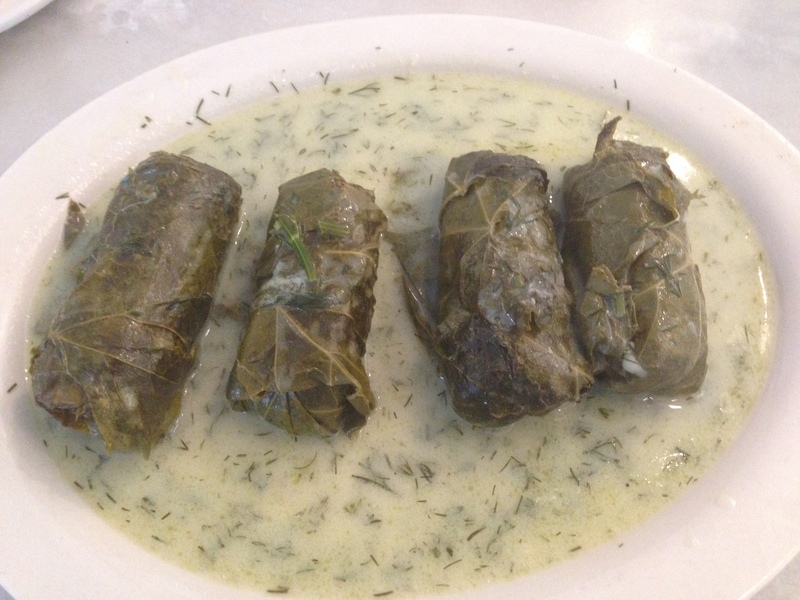 So if you’re looking for mostly lip-smackingly good Greek food that’ll make you shout Opa! 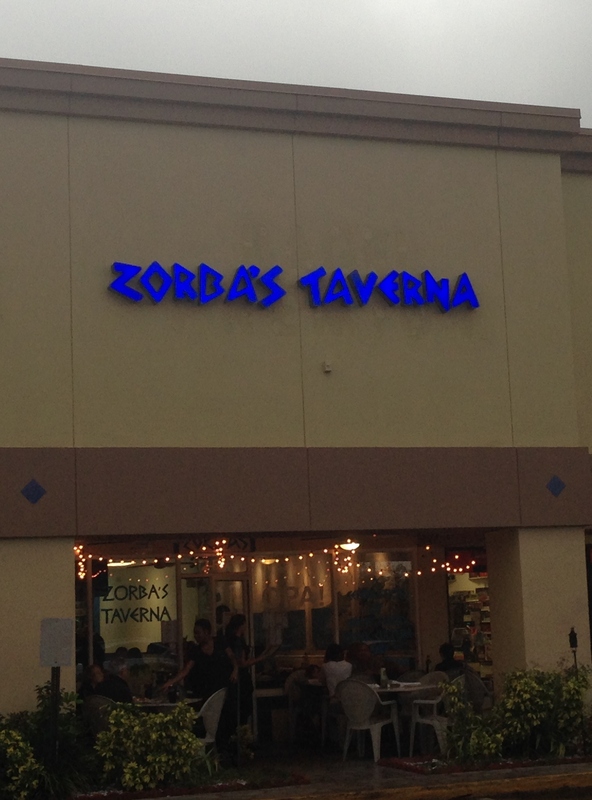 down in Delray Beach, boogie on down to Zorba’s Taverna. 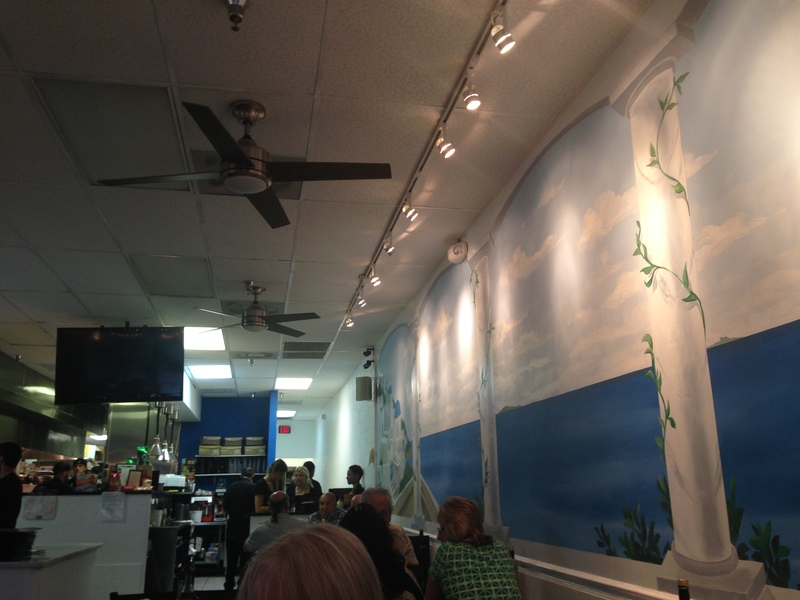 Posted in European Cuisine, Greek and tagged bread, cheese, chicken, dance, Delray Beach, flames, Florida, grape leaves, Greek, pita, rice, salad, shishkabob, tzatziki, Zorba. Bookmark the permalink. Welcome to another edition of Mastication Monologues! Today is the penultimate installation of my Portland, Oregon adventures, and this post will finally touch on the craft brewing scene that Portland has to offer. I met some new friends during one of the educational sessions on motivation in the classroom, and they seemed quite interested in inviting me out to dinner with them. So after I had to do some schmoozing with some State Department representatives, I was on my way to Bridgeport Brewery located at 1313 NW Marshall Street Portland, OR 97209. It was a bit of a pain for me to get there by the streetcar system, but it seemed to be no problem for the girls by car. 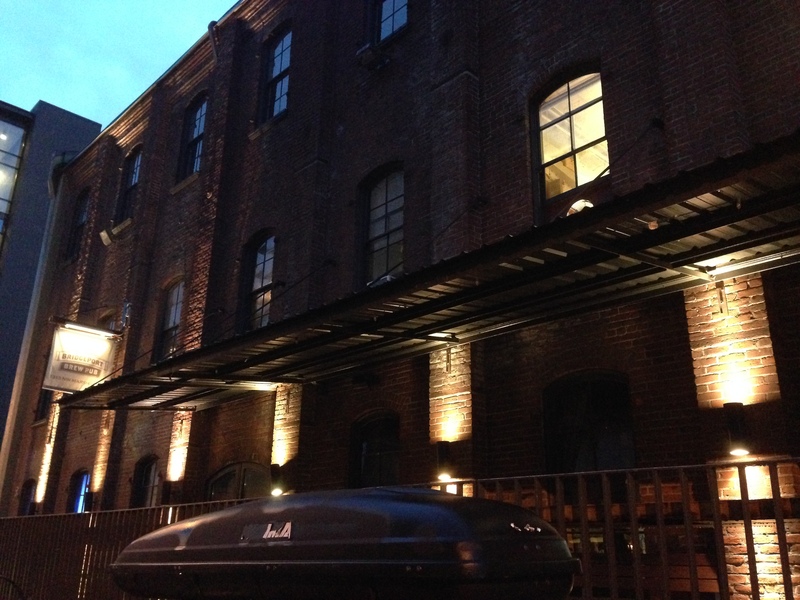 The exterior of the restaurant looked more like a Victorian factory where I half expected to find rows of women churning out textiles while small urchins scampered about fixing broken down weaving machines. Thankfully, the interior is much classier than a sweatshop, and the service is quite cordial. After roughly a 20 minutes wait, we were escorted to our table. We started with some drinks which naturally were beers. 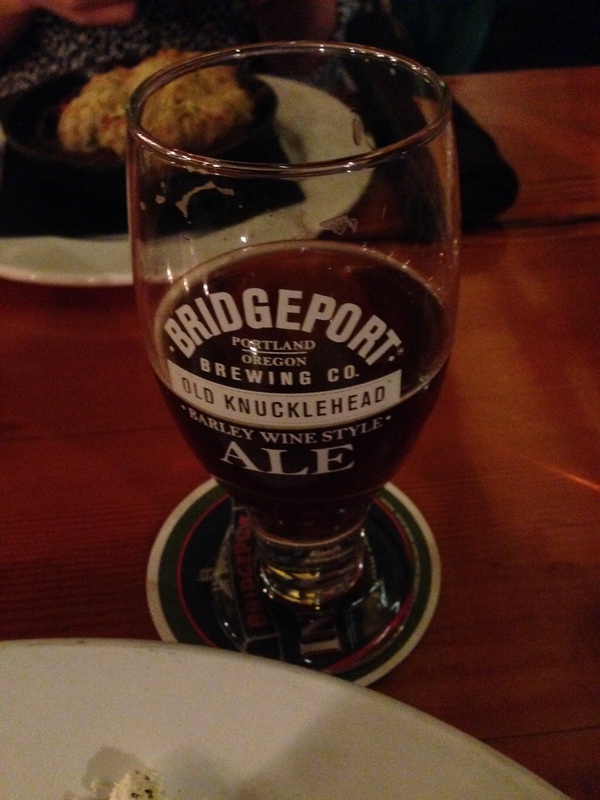 I first went for a pint of limited edition Old Knucklehead ($7) brewed at Bridgeport. It’s a barley wine ale which is very aggressive in flavor initially but has a soft finish of oak, cherry, and a bit of vanilla. I also tried their very rare cherry chocolate stout ($8) that also is brewed at the restaurant that lived up to it’s name. Think Guinness mixed with a very hearty black forest cake. Foodwise, they have all the basic gastropub foods like burgers, sandwiches, soups, and salads, but I wanted to try something different (go figure). 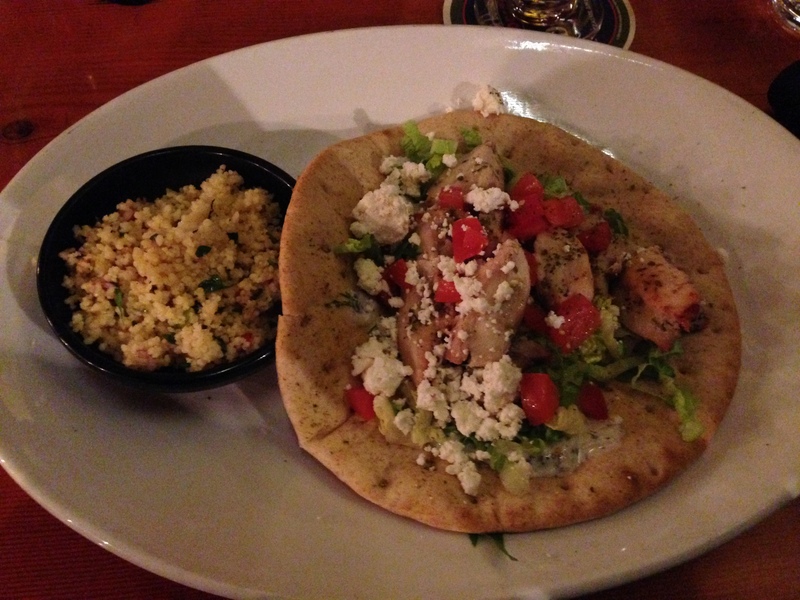 I looked down their “favorites” section of the menu, and I cast my bet with the chicken souvlaki ($10). I know I could probably get much better back home in Chicago, but I decided to see the xeni (non-Greek people) take on this Mediterranean classic. It came out with my beer, and it looked a lot better than the pasta and burgers people got. The Greek dish was a solid meal. 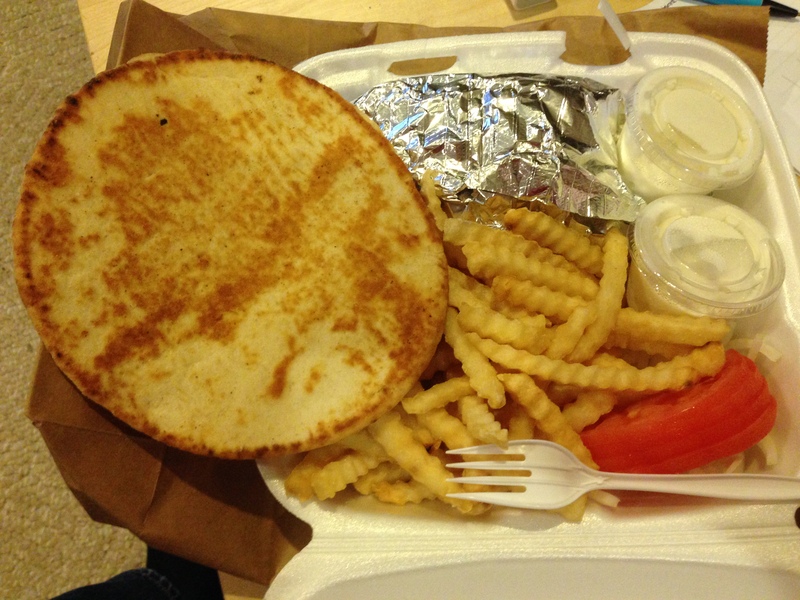 The pita was warm and fluffy, and the tomatoes and lettuce were fresh. 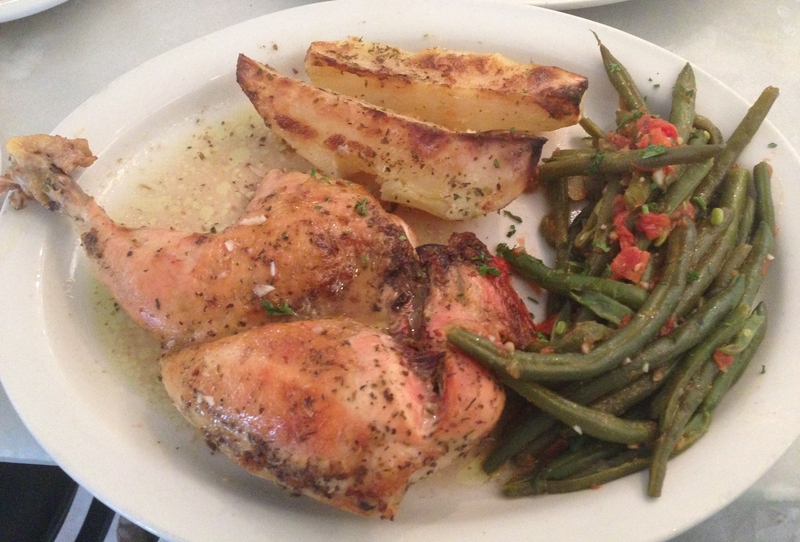 The chicken pieces were succulent and not rubbery, a common pitfall for any chicken dish. 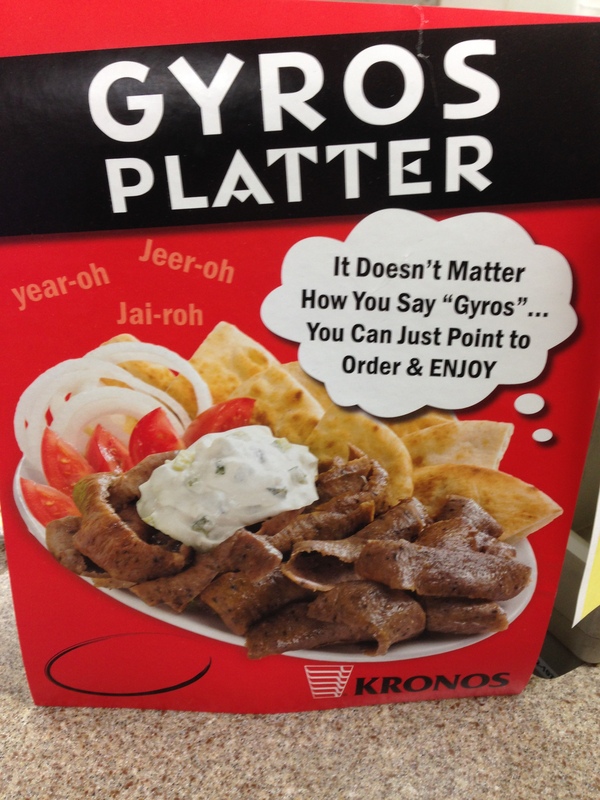 I personally think it could have used more tzatziki sauce and feta cheese, but it didn’t make that much of a difference. The souvlaki also came with a side of vegetable couscous salad which was competently made but didn’t make me shout “Opa!”. 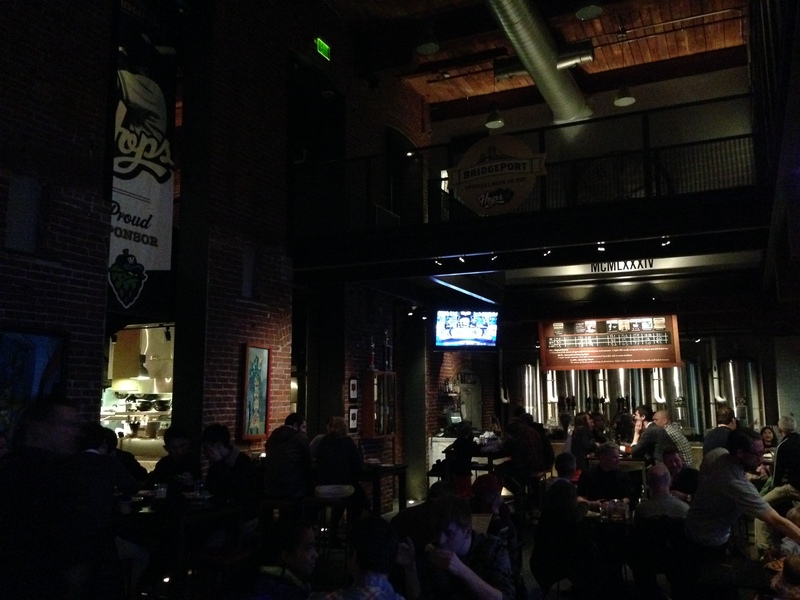 Overall, in regard to Bridgeport Brewery, I would follow the advice of my friend who is a native to Portland and was at dinner with us, “Come for the beer, stay for more beer. 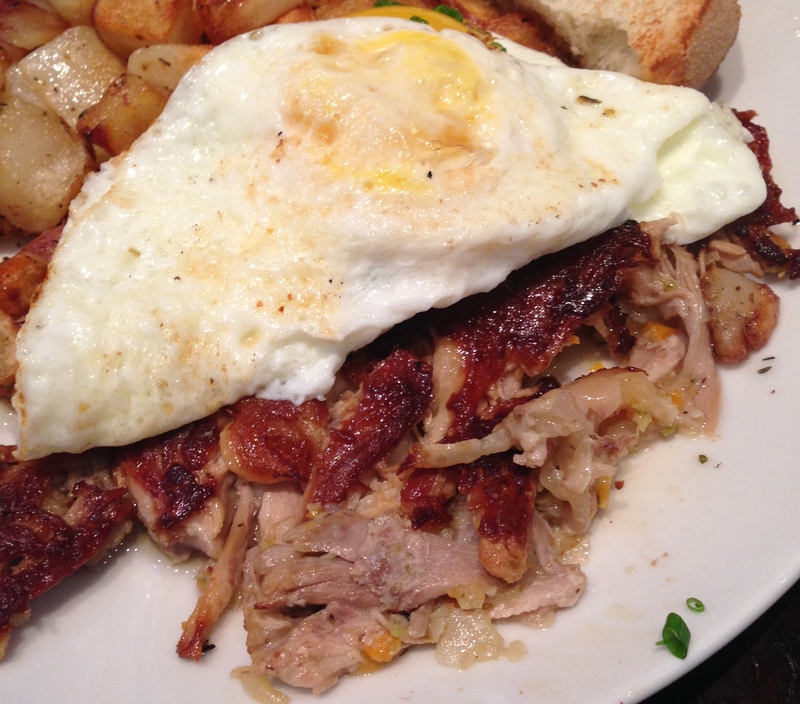 Food is secondary or maybe tertiary in Portland gastropubs”. Well put, sir. 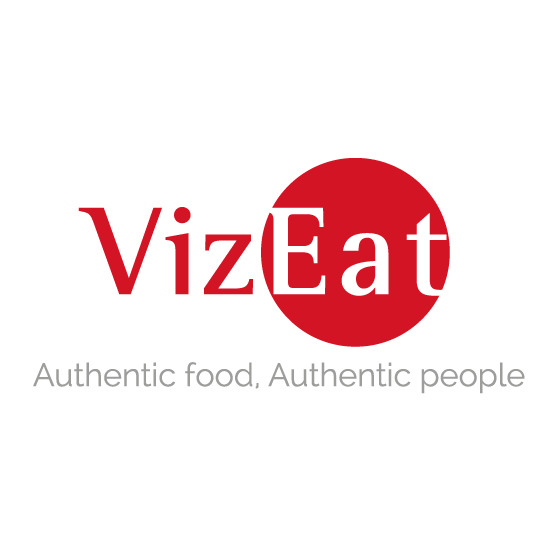 Posted in Alcoholic, American, American Cuisine, Beer, Beverages, Burgers, Comfort Food, English, European Cuisine, Greek, Pizza and tagged ale, Beer, burgers, craft, Greek, microbrew, Oregon, pasta, pita, Portland, salad, souvlaki, stout, tzatziki. Bookmark the permalink.